Tar Sands Oil in Lake Conway? Since the oil spill in Mayflower, official studies have shown an absence of tar sands oil in Lake Conway, but an independent study shows otherwise. ExxonMobil has been charged with gathering water quality data for the Arkansas Department of Environmental Quality since April 6th when it took over responsibility from the Center for Toxicology & Environmental Health. Scott Smith of Opflex Solutions, an oil clean-up company, released preliminary results that stand in contrast with official findings. 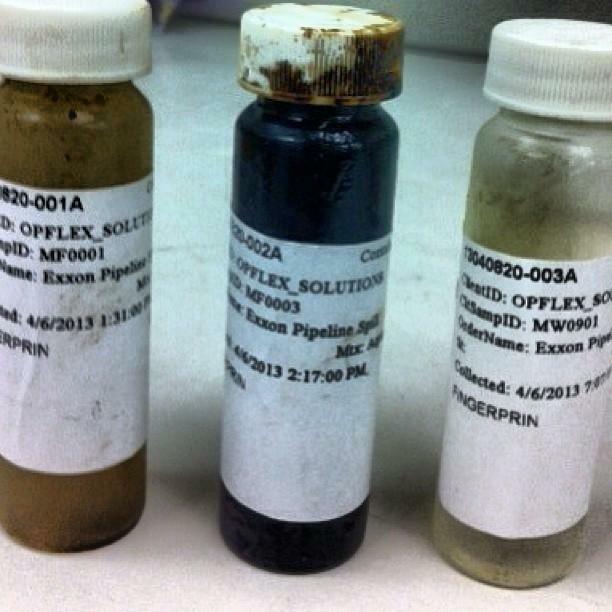 Samples collected over the weekend by Opflex. Keith Stephens of Arkansas Game and Fish responded to the independent findings of oil in Lake Conway. Smith identified what he believes is the cause of discrepancies. Stephens says at this point he is not too concerned for wildlife in the wake of Smith’s finding. There have been no plans announced from A.D.E.Q or Game and Fish to deviate from current evaluation and testing procedures in the Mayflower area. It could be several more days before nearly two dozen residents of a neighborhood in Mayflower will be able to return to their homes. Crews continue cleaning up after an oil pipeline broke Friday. Walking through the neighborhood, there’s still the distinct smell of oil, though Faulkner County Judge Allen Dodson says it’s certainly much better than it was. Work is to begin to replace a storm drain in a Mayflower subdivision where an ExxonMobil pipeline ruptured on March 29 and spilled thousands of barrels of oil. Faulkner County Judge Allen Dodson told the Arkansas Democrat-Gazette that work to excavate and replace the drain that collected oil runoff is to begin Monday. Dodson says the project will take 10 to 14 days to complete. Dodson says replacement of the drainage system will include removal of contaminated soil and precautionary sampling to ensure complete cleanup.